Chances are, if you’re in your 30s or older, if you’ve ever been pregnant, if you’re a smoker, or if you have a penchant for spicy foods, you’ve probably experienced the burning, painful effect in your lower chest known as acid reflux. Acid reflux, or heartburn, affects more than 25 million Americans every day. Some acid reflux can be caused by the foods we eat or certain lifestyle factors. 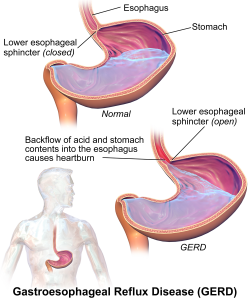 But other times, acid reflux can indicated a more serious underlying problem, such as hiatal hernia or a condition known as GERD, gastrointestinal esophageal reflux disease. More commonly known as heartburn, acid reflux actually has nothing to do specifically with the heart, although some heart conditions can cause sensations similar to acid reflux. Rather, the term refers to the location of the discomfort and burning, which is felt in the area of the heart. Acid reflux occurs when the harsh acids of the stomach splash up into the lower area of the esophagus, causing pain and burning. The stomach is actually full of acids, which are helpful in digestion. The stomach itself is not harmed by these acids, because it has a special protective lining. Normally, a sphincter, or valve, between the stomach and the esophagus keeps those acids where they belong. But sometimes, that valve malfunctions, allowing these acids to leak into the lower esophagus. The esophagus does not have the same special, protective lining as the stomach, and the acid irritates the esophageal lining, causing the familiar burn. Sometimes the acid makes it all the way up to the esophagus to the area of the upper throat known as the pharynx. When that happens, you may notice a sour taste in the back of your mouth. Reflux is a Latin-based word which actually means “flowing back,” and that’s just what is happening when you feel the burning sensation of acid reflux. There are many factors that can cause the valve, called the esophageal sphincter, or ES, to allow acid to flow upward from the stomach. Certain foods can cause irritate the stomach, causing churning and over activity that can propel the acid back through the ES. Late-night snacking is also a culprit: when we lie down, the stomach acids naturally press on the valve, and can cause it to allow some acids to escape. Pregnancy is also often accompanied by acid reflux, especially in the later months. Other factors, such as smoking, obesity, and even certain exercises can cause acid reflux to occur. There are things you can do to reduce acid reflux. Knowing which foods to avoid is a good first step. While it’s true many spicy foods can exacerbate the stomach, causing acid reflux to occur, making smart diet choices doesn’t mean you have to give up all of your indulgences. Lifestyle changes, like weight loss and giving up smoking, can also have an impact on the amount of acid reflux you experience. There are also many treatments you can try, which may alleviate your symptoms. Some of these are all-natural remedies, while others are available over the counter at any pharmacy or superstore. For more serious, persistent acid reflux, your doctor may prescribe medication to suppress acid production and soothe the lower esophagus. In some severe cases, surgery may be necessary. Acid reflux that occurs on a regular basis may indicate a more serious condition. If you have regular b outs of acid reflux, you should see your doctor, so he or she can perform tests to rule out these conditions. While acid reflux is more common in adults, children and infants also can experience the condition. Even pets can have acid reflux. If you have acid reflux, you’re not alone. The good news is, there are more treatment options available today than ever before. This site can provide you with a lot of information to help you deal with your acid reflux, and to help you make the decisions that can actually alleviate or eliminate your symptoms.